Hundreds of smooth shards of glass collected from area beaches comprise each piece of Cornwall, UK-based artist Jonathan Fuller’s work. 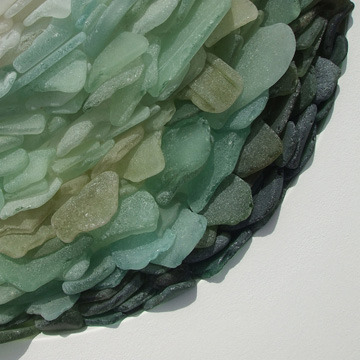 View his gallery of sea glass assemblages here. For artwork made from debris washed ashore on California, Australia, and east Africa beaches, see earlier Unconsumption posts here, here, and here. I’m so glad to learn I’m not the only person who’s got a thing for sea glass.